I spy with my Little My…..
My nine-year-old reminds me of “Little My“. 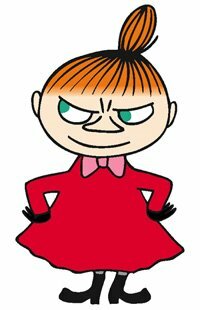 This character in “the Moomins” is a very direct, no-nonsense little girl with a strangely adult approach to life who is highly independent and sometimes discomfortingly honest. Although my daughter is not half as abrasive as Tove Jansson’s character, she has a lot of “Little My” about her. Seeing life through her eyes is both refreshing and revealing. I remember the day I ceremoniously told her that I had kept my wedding dress in case she wanted to use it one day. Her eyebrows shot upwards, then plummeted into a frown. To the delight of her youngest aunt, she retorted with a scowl: “No way! You can give it to someone else, I’m never getting married! I’m going to live with my two cats. I’ll have a boyfriend, and he can come to visit if he wants – but then he goes back to his house and leaves me alone”. Last week, Little My and I wandered through the village cemetery on our way home. It’s a little lugubrious, I know, but I love walking in cemeteries. Little My was impressed by the headstones, and was curious to know how they had fitted so many people into one crypt. She quickly started noticing beautiful names, calculating ages and trying to work out who was related to who. We were soon involved in a morbid but highly interesting conversation. “Have you written a will?”, she enquired. “I’m going to write one soon. When I’m old, I want to be crematified, but only after I’ve died. I’ll give all my painting stuff to my brothers, and my house and my cats too”. We continued walking, our shoes crunching on the gravel. “Oh, and I’ll leave my nicest clothes to my best friends”, she added pointedly, looking sideways at me. I got the message immediately. I was wearing the dress, the one she has been coveting since I bought it three years ago. She has already made me swear that I will put it aside for her when I’m either too old or too fat to wear it any more, and casts an eagle eye over the zipper every summer. “It’s cremated, not crematified. And don’t worry, the day I pop my clogs you will be free to take whatever you want from my wardrobe, chérie”. She jumped up and wrapped her arms around my neck to plant a kiss on my cheek. There’s no doubt about it, the kid rocks. Further along the pathway, she stopped and stared at a black marble flower-pot sealed on a tomb, the letters “AV” engraved on it in garish gold lettering. She shook my arm and muttered, “Look, mum, that grave’s for sale”. It took me a minute of confusion to understand: “AV” in French is an abbreviation for “A Vendre”: “For sale”. I attracted her attention to the inscription on the tombstone, and she grunted, “Oh, ok. It’s his initials, I get it. But why on earth did they put them on the pot? Did they think someone was going to run away with it?” I always put her initials on her stuff incase she leaves it on a park bench or someone picks it up by accident. I hugged her, and we walked on. One epitaph got her thinking. It was over the top, over emotional, and otherwise too good to be true, and Little My said so in as many words. This got us wondering about epitaphs on tombstones. We discussed the fact that nobody has “Good riddance to bad rubbish” chiselled into the stone in gothic lettering, however uncharitable they could have been during their lives. So, said Little My, why do people lie about it? Or do we all have the right to being pardoned when we pass on? We took the example of Grande Mamie, her great-grandmother. She had always said, “I’ll bury the lot of you”- and as far as her immediate generation was concerned, she almost did. 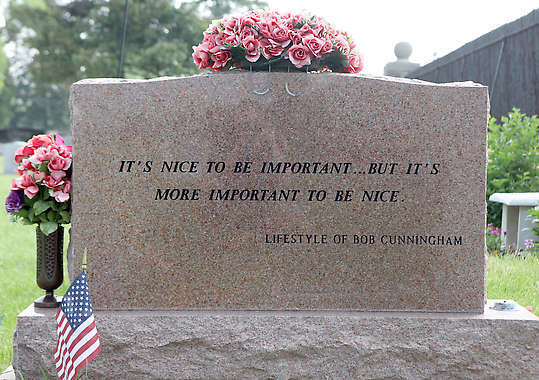 We both agreed that although it would have been cool to see it written on her headstone, it obviously it wouldn’t have been politically correct. Yet for those who knew her well, it would have been most appropriate. (I had also suggested using her wardrobe as a coffin to avoid disputes over who inherited it, but that’s another story). So, Little My asked, what would I want written on my tombstone? Chewing it over, I admitted that all the sappy “best thing since sliced bread” rhetoric would probably make me turn over and vomit in my coffin, and that I’d go for: “I almost made it, but I had a ball trying”. The story of my life, from the Roquefort that fell off my fork millimetres in front of my mouth at Christmas and exploded on my plate, splattering my dress, to my success at combining motherhood and business creation, which I am still working on. And in the mean time, what the hell….. I’m having fun.